MR removed video of TVXQ duo performance has been spreading on internet and becomes a hot issue. Various internet community websites published MR removed video of the boys’ last title track ‘Why’ performance. 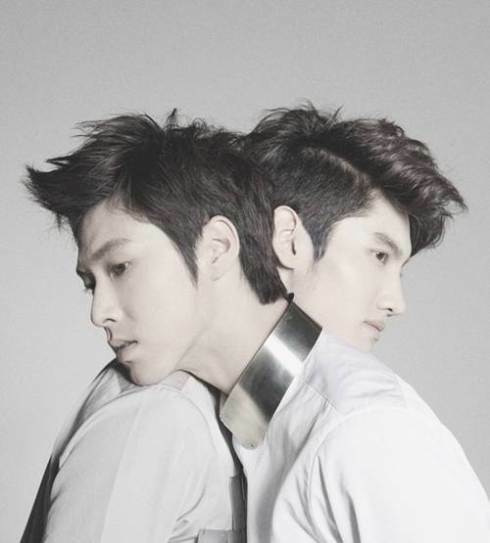 U-Know Yunho and Choikang Changmin had just unveiled their first live performance on January 7th at KBS 2TV music program ‘Music Bank’. Fans who watched the MR removed video commented, “They really have great skill in performing live” “There’s only a little difference than the CD version.” “Both performance and the song itself are excellent” and “What a crazy singing skill”. Netizens raised their thumbs as the duo had excelled a stable vocal regardless their particular hard dance routines at the performance. 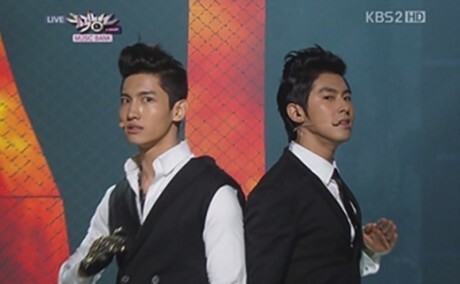 Meanwhile, TVXQ had a comeback at MBC ‘Show! Music Core’ on the 8th and will also plan to perform at SBS ‘Inkigayo’ on the 9th. After pre-recording for their comeback stage on KBS 2TV’s “Music Bank” today, the boys of TVXQ met with reporters to discuss their love for the stage, their ambition for a strong performance, and to clarify the controversial ‘Thanks To’ message. The duo also completed an interview with KBS 2TV’s “Entertainment Relay,” which will broadcast at 9 PM KST on January 8th. 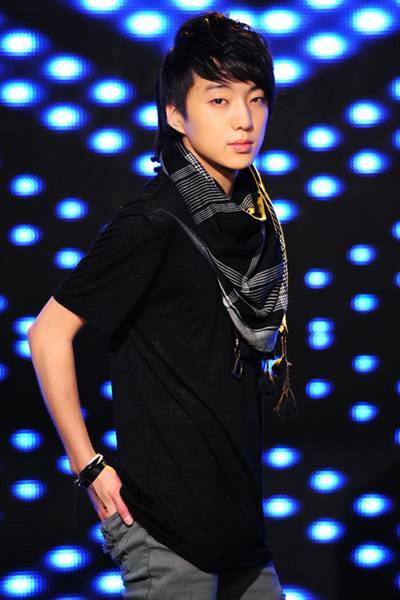 Mnet ‘Super Star K2′ contestant Kang Seung Yoon confessed that he wanted to be a singer after watching TVXQ . [TRANS] 101021 “LEE SEUNG GI VS TVXQ”, WHICH ONE IS HAN HYO JOO’S MUSIC TASTE? The day before interview on the 19th Han Hyo Joo appeared at KBS2 ‘Hee Yeol sketchbook’ and performed a song on stage. “Due to cold, my throat was not in its best condition, so I was wondering if I sang well? Yet since everyone seemed to enjoy it, it was really fun.” she said. In fact, Han Hyo Joo has a great interest in music, eventhough acting is her desire, yet she still works in music as a hobby and will participate in a coming fall music festival called Grand Mint Festival for two days on October 23 and 24. “When I was young, I learned varieties instruments from violin, piano, to guitar. It started well but the problem is when I had to stop it” as she laughed. Suddenly we now become curious about Han Hyo Joo’s music taste, in which Han Hyo Joo replied, “I like a lot of indie bands, mostly I’m into pop music.” she also mentioned, “Youngwoong Jaejoong (TVXQ) is one singing so good.” From TeleCinema ‘Heaven’s Postman’ where Youngwoong Jaejoong and his group TVXQ contributed in the movie’s soundtrack, she learned to actually appreciate the true worth of their music. Then how about Lee Seung Gi who acts together with her in ‘Brilliant Legacy’? To this question Han Hyo Joo replied, “Seung Gi makes good music too.” in trembling voices that drew laughters. [Trans] 100930 Will JYJ’s First Album Surpass TVXQ? 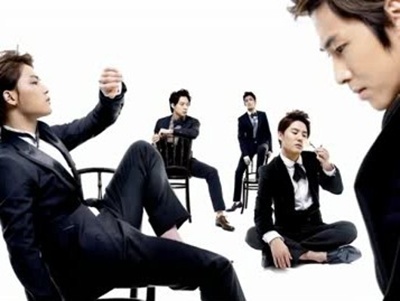 JYJ is attempting to break a new record for album sales. JYJ will be releasing their first global album on October 12th. 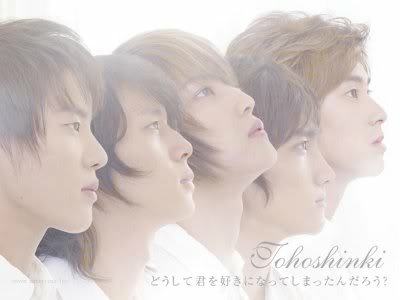 As the team is comprised of former TVXQ members Micky Yoochun, YoungWoong Jaejoong and Xiah Junsu, many predict that this album will have a great impact on the music industry. TVXQ, which the three members were a part of, set a new milestone for album sales when they sold 500,000 copies of their fouth album . It left a deep impression on the industry as at the time, the offline album market was in a deep slump. is predicted to have an explosive reaction as it is the first album in two years that the trio are releasing. All 99,999 luxury package limited edition CDs have been pre-ordered which means that the trio has sold 100,000 copies in a single day. To add to the industry’s surprise, 50,000 copies of the normal package have already been pre-ordered as well, two weeks before the release of the album. One of the reasons the album is garnering such attention is because it will be released worldwide. As their former group TVXQ even made it in the Guinness Book of World Records for having the biggest official fanclub in the world, many predict that the number of albums sold across the continents will be impressive. As bulk orders are being made from countries such as Japan and China, some are even speculating that they will sell over 500,000 copies and surpass their former record. [TRANS] 100923 “Doushite” To Be Based As A Song Drama! Tohoshinki’s mega popular song “Doushite Kimi Wo Suki Ni Natte Shimattan Darou?” will be included in a song drama! Emphasizing heavily on the expressions of the world and pure love behind the lyrics, the song left us with a deep impression. This is a song that will always remain in our memories as we can’t help but be immersed into the lyrics. With the theme revolving around pure love, the scenes of lyrics that the main female and male characters will be interpreting is going to be included in the CD, thus naming it as a “Song Drama”. This will be mainly aimed towards female consumers who view the world’s theme on love.